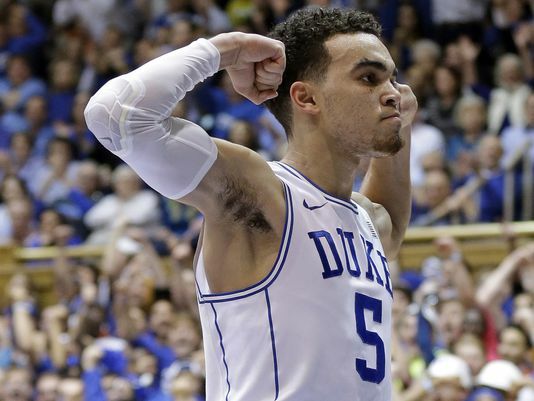 Tyus Jones, he of Apple Valley, Minnesota lineage, is the third of the three freshmen from Duke declaring for the draft. He is also the prospect with the murkiest future. A 6’1” point guard with excellent vision, high basketball IQ, and average athleticism, Jones will probably have to wait until the playoff teams start picking to hear his name called. However, he has shown that he can fit in with other high usage players and take over the game when it’s Magic Johnson’s favorite portion of the game, winning time. In fact, if there is one indelible legacy that Jones leaves at Duke is that of being perhaps the most clutch player since Laettner or Battier. When Duke was down or needed a spark, Jones created something. When they needed free throws to ice the game, Jones knocked them down. When Duke needed a bucket at the end of the shot clock while trying put a close game away, Jones would rise up and hit a three. He did it against UNC (twice), UVA, and Wisconsin (twice). However, in terms of the measurables that NBA draftniks obsess over, there is less to be excited about. He is on the small side for an NBA point guard (at least in today’s NBA); he is not a blur with the ball. He does possess excellent passing skills, vision, and an underrated change of pace game that gets to the mid-range and draws fouls. He’s never going to create his own offense or breakdown defenses on a consistent basis, but he’s an excellent steward of the ball, knows where the next pass should go, and can knock down open shots. Unfortunately, the point guard position has shifted to hyper-athletic, ball-dominant razor blades like Russell Westbrook, John Wall, or Kyrie Irving. Jones is not in that mold. As Bill Simmons might say, he would be a homeless man’s Chris Paul. While Chris Paul’s athleticism and strength is underrated in his success, Jones exhibits some of the same innate point guard attributes that makes Paul so special. Jones will not have to be taught how to run an offense, how to play pick and roll or how to feed the post. But he also will not grow any more, become much quicker, or learn to jump much higher. The team drafting him will have plan for a steady point guard who can run the offense, get other teammates the ball in the right spot, and not turn the ball over. For these reasons, his ideal fit would be as an understudy to Chris Paul. He could learn from the best, bolster a horrendous bench, and eventually become the heir apparent to a team that would potentially still have Blake Griffin. Unfortunately, the Clips traded their 1st round pick with Jared Dudley as a salary dump. So while Jones’ NBA future is a little more in the air than his contemporaries, his legacy at Duke might be the one that sits up there with Laettner, Battier, and Nolan Smith. Every fan wants to see a MN boy play for the wolves – and a PG with ability to shoot and pass is welcomed on every team. The we look and realize that this kid is very young – limited experience – and 6’1″ and you realize that he is a JJ type player. Great energy – honed skills – but with Rubio, being backed up by Brown/LaVine both players with the size and ability to play and defend SG as well as PG, there just isn’t any reason to go for Jones. I do hope that someone takes a chance, and he makes the most of his opportunity. Just not with the wolves.